The best way to impress the interviewer is to attract them in a manner that they start feeling highly impressed by the individual giving the interview. The more the student will learn to manipulate the question for their better upliftment, the more the chances will be of their hiring in the particular company. One should be keen and should know what and how things should be done to get the full advantages of the opportunity. The more and better they will be prepared, there will be more chances of them getting selected. Every student appearing for the interview should prepare for ‘what is your hobby’ question before stepping into any interview. The following are few best ways to help while answering hobbies interview questions and answers. If you like playing sports or if you are highly indulged in some sport this can really be an asset in your resume as it depicts that you are active and energetic. Even if you play your sport once in a while you should be thorough with the rules and regulations that regard the particular sport. Cricket, badminton, football, hockey, chess, table tennis, there are various sports played in our country every year. We should know all the basic to detailed knowledge of the sport, we like playing. One should know all the names of the ingredients used in making any recipe in English. One should at least murmur one or two recipes completely as the hr interviewer can ask for any recipe. One should be well known with the latest dishes and a television show that regards cooking. Cooking is a difficult hobby and one should know basic details about it very well. Cooking tells the hr about the patience and helping and giving nature of the student. People have a hobby of collection. If collecting coins or any material thing is going to be true then the person having such hobbies should be very dedicated and should know all the things and should have a collection of previous coins. Collection should be from a very long time and the collection should consist of coins of every country if possible and it either should be framed or kept in a particular box. History of coins should be known to the student. 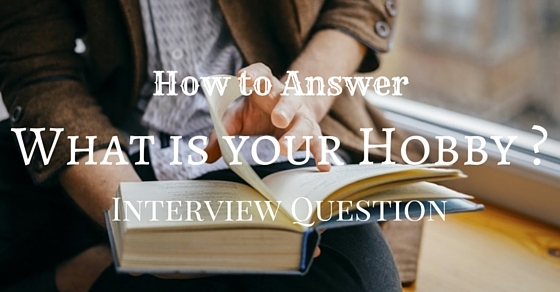 Reading books is a common answer we hear for interviewer question ‘what is your hobby’. It is an amazing hobby, it dictates that the student is highly sincere and have full of knowledge. The student specifying that reading is their hobby should know the minute details about the books they have read. The number of pages that book consists of or the author who published that book. The book readers should know at least five to seven books name by their favorite author and they should be able to give a summary about the book they last read and how much time it usually takes them to read any particular book. This is again an important hobby that usually a student says during their interview. If we are saying watching television is our hobby then we should know the minute details that make the television show the way they look like. One should know the name of the producer, directed, or dop of the televisions. One should know the real name of the actors playing a particular role in any television show. Watching television can also be a great hobby if the person is well known with the basic details. Listening to music is the most popular hobby said by majority of the students. If any student is saying that listening to music is their hobby they should know first and foremost the complete lyrics of the song they like the most. The singer that sang that particular song and at least should be aware of some details about them. They should at least know 5 to 10 songs sung by their favorite singer and should be able to sing them correctly without making the lyrical mistake. Listening to music denotes a student’s interest in learning new things. Students often have a habit or hobby of playing video games. The student playing a particular game should be well known with the game they are playing. They should have the latest gaming devices and should also be aware of the game and how to play them. They should have huge collection of games through CD or DVD. They should be able to explain about their hobby in front of people and should proudly answer all the questions. Playing cards or game often depicts the creativity of the student. An animated movie is also a hobby especially for boys. They love watching the Hollywood animated movies and have a great collection of such books. If a person is having this as their hobby first and foremost they should have watched all the recent movies that were animated. Should know the basic of how animated movies came into existence and should know what the next movies are that is going to come and should also be able to give a brief summary about the last animated movie they have watched. This is often the hobby of those people who adores food the most. They like eating at anytime of the day. They can eat whatever comes to them. A person who says they eat a lot should know about various dishes that exist. They should know what are the types of dishes used all around the world. They should also be aware of the best food available in every country or must have tasted some of them. They should be even feeling hungry at the time they will be giving the interview. Travelling is also an important hobby of the students or the person giving the interview. The person saying that traveling is their hobby should have visited a number of places. They should prepare completely about the places they last visited as they will be expected to talk about that and minute details will be asked about the place where they last visited. The person having travelling as a hobby makes the interviewer’s job easy as they can assign them in any city if India as they are very adoptive. Shopping is a major hobby of the girls these days and they should be well prepared about the thing they like the most before going to place an interview. They should be very well aware with the basic brands that are most popular around the world. They should know the exact price of the thing they last bought and should also have shopping cards of almost every big industry that supplies great clothes. The person who has shopping as their hobby are considered fun loving and an extra point goes to them. People are obsessed with their shoes. There are some who can go crazy and buy every second shoe they like. This is a common case amongst the youth. While giving the interview it can be an advantage as the person will know the uniqueness of the student. The person saying buying shoes are their hobby should be well acquainted with the brands associated with the shoes and the most important thing the shoes they are wearing during the interview should be neat and tidy. Sleeping is the most common hobby of almost every person that goes for the interview. A person should be very well known the reasons why she/he is saying sleeping as their hobby. There is nothing an interviewer can conclude after this or will eventually switch to the next question. It can be understood as a safer option for a person not having any hobby. This might help them to get rid of the question without giving any negative impression. People have an addiction for the coffee or tea they drink and often they consider this as their hobby. The person saying drinking coffee or tea as their hobby should fully be aware of the different kinds of coffee and tea available all over the worlds and the pros and cons related with them. To avoid any other kind of intoxication people often have such hobbies and there is nothing wrong with it. A person who says they have a hobby that regards either drinking or eating are often considered a person who lives in the present. Sketching is an important hobby of people and it shows the creativity of the students appearing for it. Sketching reveals the creativeness of the students and the way they picture everything. It shows the way an individual see or react to things. A person who says sketching is their hobby will be asked to draw the scenario of the interviewer desk or it can be anything. They should be well prepared and show their creativeness. Painting is another important hobby of the person appearing for the interview. They should be well thought before going to give the interview. They should prepare about the basic stokes that comes in painting and at least should have a picture or two of their latest painting. They should know the price of the canvas of the colors they will be using for their practice. Playing instruments is also an important hobby among the students now-a-days and this is also considered as a boom as they have learned something other than their syllabus and it surely gives them an extra point. They should be well known about the basic history of the instrument they love playing, the place where it was invented, the people who are professionals in it and other important and minute details about the instrument. They should be very well prepared and if asked should be ready to play any song. So, This time if the interviewer will ask you ‘what is ur hobby’ then you can say playing instrument, to get a positive impression on you. Reading novels especially of a particular genre is also an important hobby of people nowadays and they tend to be very specific about their novels and the authors. The interviewer might ask them questions about the last novel they read or the things they like about the novels the most and the pros and cons related to the reading novel. Asking from the number of pages to name of other novels from the same author, questions may vary from student to student. Dancing is an important hobby of people and they all are either well trained or well educated. Students gets proper training to learn a particular dance form and it might help them to achieve a great physical health. A person saying dancing as their hobby should be well prepared on one song before going for the interview as they might ask them to perform. They should be well aware by the new and evolving dance forms and should know the shows or people that master the dance performance. In order to conclude, I would like to say while going for an interview and answering ‘what is your hobby’ interview question, one should be fully confident and should go through the basic questions that might be posed at you regarding the hobby. The more deeply a person will devote their time working for a particular hobby, the more will be the chances they will give the interviewer to select them. One should prepare well before going for the interview and should know all the basics of the hobby one is having an interest in. By preparing well, you are sure to get selected. On that note, Good luck.